Punarnava is a creeper that grows in plains of India. Its common name is hogweed plant and botanical name is Boerhavia diffusa. Punar denotes restoring or regaining and nava means new. It is rightly called punarnava as it brings back lost vigor and vitality. Plant length is about 0.75 to 1 meter. Occasionally it grows up to 4 meter in rainy season & dries in summer. Its roots, seeds, leaves, flowers or whole plant is used as medicine. It is a miracle herb with wonderful health benefits & medicinal uses. Punarnava is a creeper that grows in plains of India. Its common name is hogweed plant and botanical name is Boerhavia diffusa. Punar denotes restoring or regaining and nava means new. 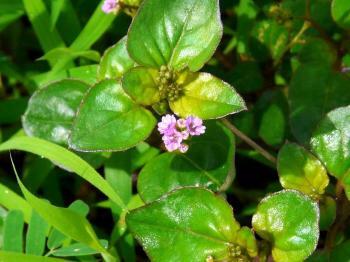 It is rightly called punarnava as it brings back lost vigor and vitality. Plant length is about 0.75 to 1 meter. Occasionally it grows up to 4 meter in rainy season & dries in summer. Its roots, seeds, leaves, flowers or whole plant is used as medicine. It is a miracle herb with wonderful health benefits & medicinal uses. The plant is best identified with tiny cluster of beautiful flowers that are pink in colour. Flowering & fruiting of plant occurs during winter. It is pungent followed by bitter taste & has cooling effect. It balances pitta and kapha doshas. Punarnava has two varieties red & white. White punarnava is bitter & astringent in taste and manages anemia, promotes digestive fire and removes inflammation & toxins. Red Punarnava is bitter in taste, cold in potency, manages kapha & pitta diseases. Red punarnava is more effective in clinical field. The active principal of punarnava is the alkaloid “Punarnavine”. The drug contains large quantity of potassium salts which account for its diuretic properties. Take the decoction of the root or whole plant 10 to 20 gms twice a day to increase urine output and reduce swelling due to renal or cardiac problems. In constant watering of eyes, Punarnava is mixed with honey and instilled in the eyes. In immature cataract, few drops of Punarnava mixed with sesame oil can be used. In night blindness take Punarnava with rice. Fresh juice of its roots instilled into eyes, is helpful in conjunctivitis. Take half table spoon of Punarnava and half tablespoon of Triphla ghrita, mix them well and take three times daily before meals in glaucoma and night blindness. In skin disorders, make a paste of punarnava root with curd and apply on dicoloured or flaky skin patches associated with itching. A hot poultice of the root can be applied on ulcers, abscesses and other skin conditions. Prepare decoction of milk with powdered root of Punarnava and drink this twice daily before food. This reduces high temperature and malaise. It helps in removing catarrhal matter or phlegm from bronchial tubes. Mix 3 gm powder of Punarnava roots with 500 mg turmeric. Give this powder twice a day with lukewarm water. Take 50 -100 ml decoction of Punarnava. It works as sleeping pills and makes one fall into deep sleep. Powder of root given in dosage of 5 gm three times a day cures intestinal colic pain and worms. Consumption of milk with decoction of Punarnava two times a day is helpful in a alcohol intoxication. 10 to 20 ml juice of whole plant with 2 to 4 gm bahera powder is useful in jaundice. Mix ½ tablespoon Punarnava and ¼ tablespoon Trikatu churna in ½ cup of warm water. Add one table spoonful of honey to it. Steep for 5 minutes. Stir well and drink without straining. Take this three times daily before each meal. Mix ½ tablespoon of Punarnava and ¼ tablespoon of Ashoka powder in ½ cup of warm water and add 2 tablespoon full of Aloe vera with a pinch of Pippali powder. Take this three times a day. Add ¼ tablespoon each of Punarnava, Gokshuru, Coriander powder, 1/8 table spoon full of Neem in ½ cup of warm water and steep for five minutes. For severe UTI take this in ½ to 1 cup of unsweetend pomegranate or cranberry juice. Whole plant 20-30 gm for decoction, root 1-3 gm for powder and fresh juice10-20 ml . The best way to consume Punarnava on daily basis is by cooking it along with lentils. To make the recipe, boil toor dal with turmeric powder, sambar powder and little bit castor oil along with little water in a cooker for three whistles. Heat a table spoon full of ghee in pan and splutter mustard, asafoetida and add a handful sliced small onions/shallots along with curry leaves and one red chilli. Once the onion turns translucent, add one finely cut tomato and fry till mushy. Now add the finally cut Punarnava and fry for a minute. Add little water and salt and boil till leaves are cooked. Once the leaves are cooked add boiled Toor dal and bring to boil. Then add a table spoon of freshly grated coconut & switch off. Its taste is very nice with rice. This preparation prevents jaundice, anemia and gastric problems. Best home remedy for kidney patients. Dosage is about three table spoon morning and evening. To make decoction, first pound 20 gm root in a mortar and pestle specially the thick root as the mature roots offer the most health benefits. Then add it to a cup of water and boil till it reduces to half. The decoction is ready. If boiled with little bit of bruised peppercorns, it gives relief from chest congestion and cough. Clean the roots well and cut into fine pieces. Now heat around 100 ml of castor oil in a pan and fry the roots along with five peppercorns in a low flame. Once the roots are cooked, strain the oil. To use the oil as remedy for constipation, take around one tablespoon for adult and half table spoonful for young children. In more doses, it may cause diarrhoea. This oil works as blood purifier and is very good in treating skin related allergies. Include Punarnava in the daily diet to purify the blood, rejuvenate the body and get rid of toxins. • Used in arthritis as it reduces inflammation in joints. • Treats all disorders of kidney and decreases blood urea level. • Good in impotency & can enhance libido. Increases the quality & quantity of sperm. • Acts as carminative and increases appetite. Aids in digestion, decreases abdominal pain & relieves constipation. • Reduces cough & asthma. • Good for skin diseases and brilliant natural remedy for guinea worms. • In combination with other herbal ingredients, it helps to treat anemia. • It has diuretic property and is used for kidney stones. • Used to rejuvenate liver and detoxifies it. Helps in jaundice and hepatitis. • Rejuvenates whole body and boosts the immunity. • Has anti obesity effect. • Has anti bacterial properties and is used in treatment of gonorrhoea. • Used along with giloy to treat dengue fever.